People in Northern England are nice. That’s what I had heard, and my first couple weeks in Sheffield have certainly proved that assertion. When people come into the office, they inquire as to how everyone is doing. They are all very friendly and concerned with what is going on in your life. It has certainly made getting into the swing of working here in the UK easy. All this friendliness does have one major drawback. It has to do with what happens whenever anyone gets up to head to the kitchen. “You want something to drink?” they will offer, and they aren’t just being polite. Nope, whoever is heading to the kitchen will offer, and anyone who wants a drink says, “Yes, please.” The person heading to the kitchen will return a few minutes later laden down with cups and glasses for the team. The drink most often requested is a cup of tea, and that frightens me. I was never much of a tea drinker back in Canada. I had tea a few times a year, and mostly when other folks made it. 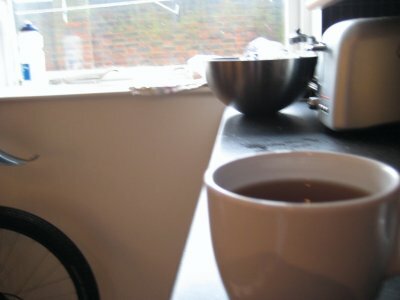 Here in England, though, I have been drinking tea more and more. It is constantly on offer and everyone is drinking it. It is hard to avoid. Not that I mind drinking it too much. A decently made cup of tea with a touch of milk is a very tasty thing. 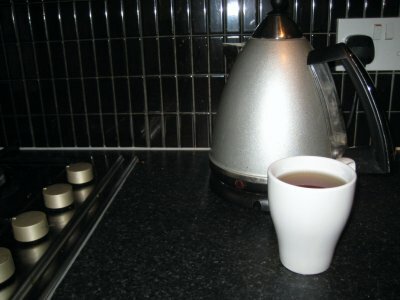 The problem is that while I enjoy a cup of tea made by others, whenever I make the stuff, it tastes like swill. I don’t know what I am doing wrong. Perhaps I leave in the bag too long, or not long enough. Perhaps the water is too hot or too cold. Perhaps I add too much milk, or not enough, or too soon, or not soon enough. I don’t know what I am doing wrong, all I know is that my tea doesn’t taste like the tea other people make. It tastes bad, and that is my problem. See, whenever I find myself thirsty at work, I can’t just get up and head to the kitchen, because then I would have to offer to get drinks for the team. They would ask for tea, and I would be forced to make the brown-coloured bog water that seems to result when I put a tea bag in hot water. Like I said, people in Northern England are nice, so I am sure they would drink the tea I make, put on a brave face and make yummy noises. “Good tea,” they would say, but it wouldn’t be. It would be awful, but they wouldn’t want to offend me, so they would say it’s good. They would think that Canadians can’t make tea. Some Canadians probably can make tea, but I can’t, and I don’t want to be the cause of half of Sheffield thinking that Canadian tea tastes like bitter water. Of course, now I feel guilty whenever anyone else gets up to get a drink and offers. I can’t say yes, because I never get up and get the tea myself. The Sheffieldites would see me as the greedy type, always taking and never returning the favour. So instead I sit in my seat, thirsty and frightened, and count the hours until lunch, when I can get out, run down to the deli and buy myself a decent cup of guilt-free tea. Greg, I don't like to plug myself too much... but you really ought to check out my new website which is about nothing but tea, tea and more tea. teafinelybrewed.com. With regards to brewing tea, if it's black tea use freshly boiled water and steep it for about 3 minutes, 5 minutes if you prefer it a bit stronger. Not sure how much milk to add, as I'm a strictly black tea drinker. The main reason most North Americans get is wrong is they use BOILED water, and not BOILING. It must be boiling for a good (or even average) cup of tea. And if there are so many tea folks, ingratiate yourself even more by getting a work tea-pot. then all you have to do is chuck 2 bags in fill it with boiling water, and bring it and some cups/jug of milk out on a tray, and everybody can pour their own to taste... After a few days, everybody will be used the system, and it saves everybody effort. I think I might just stick with diet coke with cherry... easy, and as a North American, they all expect me to drink cola.